Andrew McAfee is coauthor with Eric Brynjolfsson of Race Against the Machine. If you have not read the book, please do. Then (or first) read Tyler Cowen’s Average is Over. Then please report back here your take on the future, and how we can best navigate where we will be in 20 or 50 years. Crimson hexagon, which King cofounded, constantly collects a huge amount of social media from around the world. By seeing which of this content later disappeared from within China the team gained an unprecedented view into a dark and fascinating topic: which aspects of its people’s speech a modern totalitarian regime wants to suppress. This view also allows us to make better-educated guesses about why and how this censorship happens. What we learn from it would have surprised even Orwell. (…snip…) As the old saying goes, “the mountains are high, and the emperor is far away.” Not any more, since the advent of social media. Citizens use these tools to complain loud and long about corrupt local officials. This provides a great way for Beijing to know who’s stealing above their station, and hence who to crack down on when the kleptomania and/or public pressure to do something about it mount too high. It’s a perverse result, but free online speech turns out to be the top despot’s great friend, because it allows him to keep his underlings in line. …the pace of actual trade settlement in renminbi has failed to keep up [with its role in finance]. It still accounts for just 0.8 per cent of the global total, a lower share than the Thai baht or the Swedish krona. That is from the FT, via Amni Rusli. The recently reported fact that the renminbi is now the #2 trade financing currency seems to be simply measuring the carry trade, not the true ascendancy of the Chinese currency as a global reserve currency. My reading list is overflowing, but it looks like Clive Clook’s recommendation has to go on the top of the Development Economics list. Are you ready for “new structuralism”? The most valuable new book I’ve read this year is Justin Yifu Lin’s “The Quest for Prosperity.” George Akerlof, a Nobel laureate in economics and a man not given to reckless overstatement, calls it “a masterpiece.” I’d say that’s right. Lin … was an observer and participant in China’s economic miracle. From 2008 until earlier this year, he was the World Bank’s chief economist. Today he’s back in China, at Peking University. Lin’s book is intellectually ambitious. He sets out to survey the modern history of economic development and distill a practical formula for growing out of poverty. It’s a serious undertaking: Lin isn’t trying to be another pop economics sensation. But “The Quest for Prosperity” is lightly written and accessible. It weaves in pertinent stories and observations, drawing especially from his travels with the World Bank. He leavens the economics skillfully. Structural transformation, of course, is exactly what China has achieved. Elsewhere Lin has acknowledged that China needs further policy reforms and that all is not well. Yet the country’s success of the past several decades is indisputable — and this is no Soviet-style industrialization mirage. Russian factories sold their output to captive markets. Nobody with a choice ever bought a Soviet-made car or television. China’s outward-looking producers are world-class. I’m typing this on a best-of-breed Apple Inc. laptop, manufactured in China. As I argued in my last column, China is a capitalist country. But how did it get that way? Lin’s answer draws on both development paradigms. He sees a vital role for government in overcoming barriers to development. But interventions, he argues, must respect compelling market realities. Of these, the most important is international comparative advantage. Poor countries have lots of cheap labor. For them, capital-intensive heavy industry isn’t the way to go. For today’s developing countries, Lin says, the global economy is the indispensable setting, and looking outward is the sine qua non of rapid development. On the input side, that’s because of the opportunity it affords for technologically driven catch-up growth. On the output side, it’s because the world is a market for exports. On this view, “export pessimism,” the idea that poor countries couldn’t prosper through international trade, was one of the biggest mistakes of the import- substitution school. Globalization is the poor’s best friend. 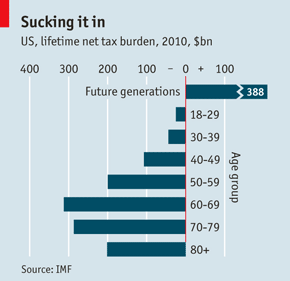 Voters need to understand that US demographic trends are bad for growth, and very bad for the total future tax burden. But majority rule democracy is not well-designed to find an optimize solution to the growing conflict between aging retirees and the working population that pays for the elderly benefits. (…)Sadly, arithmetic leaves but a few ways out of the mess. Faster growth would help. But the debt left by the boomers adds to the drag of slower labour-force growth. Carmen Reinhart and Kenneth Rogoff, two Harvard economists, estimate that public debt above 90% of GDP can reduce average growth rates by more than 1%. Meanwhile, the boomer era has seen falling levels of public investment in America. Annual spending on infrastructure as a share of GDP dropped from more than 3% in the early 1960s to roughly 1% in 2007. Austerity is another option, but the consolidation needed would be large. The IMF estimates that fixing America’s fiscal imbalance would require a 35% cut in all transfer payments and a 35% rise in all taxes—too big a pill for a creaky political system to swallow. Fiscal imbalances rise with the share of population over 65 and with partisan gridlock, according to other research by Mr Eschker. This is troubling news for America, where the over-65 share of the voting-age population will rise from 17% now to 26% in 2030. That leaves a third possibility: inflation. Post-war inflation helped shrink America’s debt as a share of GDP by 35 percentage points (see article). More inflation might prove salutary for other reasons as well. Mr Rogoff has suggested that a few years of 5% price rises could have helped households reduce their debts faster. Other economists, including two members of the Federal Reserve’s policymaking committee, now argue that with interest rates near zero, the Fed should tolerate a higher rate of inflation to speed up recovery. 32. Most advanced economies face the double challenge of high debt and rising age- related spending, particularly in health care (Figure 12). A number of countries with above-average levels of pension spending also face large projected increases in age-related outlays (Austria, Belgium, Finland, Greece, Portugal, and Slovenia). In some other countries with below-average levels of pension spending today, projected increases in age-related spending are substantial (Luxembourg, Korea, New Zealand, Switzerland, and the United States). 33. Pension reforms that curtail eligibility (e.g., by increasing the retirement age), reduce benefits, or increase contributions can help countries address these fiscal challenges. The trade-offs across these choices are illustrated in Figure 13. Beyond what is already legislated, with no increases in payroll taxes and no cuts in benefits, average statutory ages would have to increase by about another 21⁄2 years to keep spending constant in relation to GDP over the next twenty years.23 Relying only on benefit reductions would require an average 15 percent across-the-board cut in pensions. Relying only on contributions would require an average payroll rate hike of 21⁄2 percentage points. To keep pension spending as a share of GDP from rising after 2030, additional reforms would be needed: for each decade, retirement ages would have to increase by about 1 year, benefits cut by about 6 percent, or contribution rates increased by about 1 percentage point. Patrick Chovanec is keeping a watchful eye on the squishy areas of China’s economy. It’s not just the banks and the over-leveraged local authorities – the subsidized renewables are under stress. (…) Chinese solar companies blame many of their woes on the antidumping tariffs recently imposed by the U.S. and Europe. The real problem, however, is rampant overinvestment driven largely by subsidies. Since 2010, the price of polysilicon wafers used to make solar cells has dropped 73%, according to Maxim Group, while the price of solar cells has fallen 68% and the price of solar modules 57%. At these prices, even low-cost Chinese producers are finding it impossible to break even. (…) China’s censors have tremendous power in print, online, and even in public spaces such as Tiananmen Square. But when it comes to air pollution, even the Chinese government can’t obscure the facts. People see and breathe it every day. So if you need to fly to China, check out China Air Daily first. Another study, by Andrew Batson and Janet Zhang at GK Dragonomics, a Beijing-based research firm, finds that China still has less than one-quarter as much capital per person as America had achieved in 1930, when it was at roughly the same level of development as China today. Here is more, and I thank David Levey for the pointer. The post as a whole considers whether China is overinvesting and concludes maybe not. Here are further debates on how China is doing. It is shocking how gullible are the producers of This American Life. It seems obvious to me that they wanted to believe Mike Daisey’s emotional story about big bad Apple destroying the lives of underage workers making iPads. So they did not factcheck properly – “the story was so good it must be true”. The only good news is that they are taking some very small responsibility for their mistakes in giving credence to Mike Daisey’s lies. But they take no responsibility for any harm done to the workers at Apple. Not a single word of apology to Apple, Apple workers or Apple shareholders. Not a single word. It would appear that there’s momentum being gained for the idea of boycotting Apple‘s products over conditions in the company’s manufacturing chain in China. This is a very silly idea and there is much nonsense being spouted about those conditions. Apple, the computer giant whose sleek products have become a mainstay of modern life, is dealing with a public relations disaster and the threat of calls for a boycott of its iPhones and iPads. The company’s public image took a dive after revelations about working conditions in the factories of some of its network of Chinese suppliers. The allegations, reported at length in the New York Times, build on previous concerns about abuses at firms that Apple uses to make its bestselling computers and phones. Now the dreaded word “boycott” has started to appear in media coverage of its activities. “Should consumers boycott Apple?” asked a column in the Los Angeles Times as it recounted details of the bad PR fallout. Two of the New York Times articles are here and here. Dan Lyons weighs in here. I quote at such length because it is an extremely important point. Wages paid to manufacturing workers in China are not determined by the productivity of those specific workers. They are not determined by US wages, by the profits that Apple makes nor even by the good intentions of the creative types that purchase Apple products. They are determined by the wages paid by other jobs in China and that is itself determined by the average level of productivity across the Chinese economy. Tim’s graphic above summarizes some of Tim’s following points. But best to get over to Forbes to read the whole thing which includes all the resource-links that I left out above. China’s banks benefit from regulated spreads – the banks can only lose money via bad loans. But they do not book the majority of their bad loans, so reported profits are a fiction. The regulated spreads implement the Beijing policy of financial repression – transfers from savers (who earning next to nothing) to borrowers (who pay below market rates). Beijing has driven Chinese growth by credit-driven spending, much of that wasted. This spending is driving up price levels but has not generated productivity gains. Result is 4.5% inflation, massive unrecognized bad loans, while businesses can’t get needed credit. Now what? The optimistic spin on Beijing’s latest monetary easing is that policy makers are choosing to focus on growth instead of worrying about inflation, and maybe that’s true. But it pays to consider a less rosy alternative explanation: Beijing might not be “balancing” growth versus inflation—and it might not have much of a choice. At first blush the move announced Saturday—a cut in the required reserve ratio governing what percentage of deposits banks much store with the central bank—seems like more of China’s monetary same. The measure releases roughly 400 billion yuan ($63.5 billion) into the banking system. The conventional explanation is that Beijing is worried about access to credit becoming too tight for businesses and, since everyone claims inflation will dissipate later this year, is engaging in some prudent pump-priming. Tinkering with reserve ratios is one of Beijing’s favorite policy tools. But something has changed this time around: capital outflows. That fine-tuning approach presupposes a system in which capital controls keep money more or less locked inside the system. Before now, money not deposited with the central bank could be used only for credit creation. Increasingly, another option is opening up—sending or keeping money abroad. Some $34 billion might have left China in the last three months of 2011. There are also signs that some exporters are keeping their earnings in dollars offshore rather than converting to yuan and putting that money into the banking system. January saw a return to net inflows, but then banks face another drain on liquidity, increasing competition for depositors. Banks are creating a range of “wealth-management products,” which are often risky credit-related products that create substantial off-balance-sheet liabilities, in an effort to woo depositors. There’s frequently a big mismatch not only between the high interest rates offered on these products and the regulated low rates banks can charge on loans, but also between the short maturities of deposit products and the longer terms of loans. (…) It might seem odd to worry about inflation, capital outflows and tight liquidity at the same time, but that’s a consequence of China’s distorted financial system. Because allocation of capital remains politicized, a significant portion of the credit stimulus has gone into wasteful projects; since that money is not creating real growth or productivity gains, it chases too few goods at higher prices. Meanwhile, those who need cash—including bankers and small and medium-sized businesses—can’t get it. Liquidity injections might help bankers with short-term funding. But absent broader reform, that cash will only follow earlier credit down the inflationary rabbit hole. This highlights what is set to become China’s most serious policy dilemma of 2012: how to balance the risk of inflation against the risk of financial instability. This is a far more perilous tightrope than the old growth-vs.-inflation acrobatics.